From Couch to Ironwoman: Half Ironman: Check! No, you didn't miss anything. 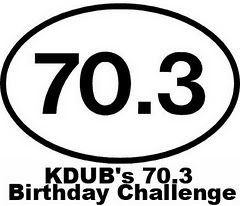 I'm not actually a Half Ironman, but I did complete KDUB's 70.3 Birthday Challenge yesterday. If you would like to wish her a belated happy birthday (her birthday was yesterday) head on over to her blog to do so! This challenge was a great way to get Mike and I to start cross-training and training for our upcoming duathlon and triathlons in the spring/summer. Mike actually didn't complete the challenge, but it's not his fault! He ended up getting a flat tire one of the nights we were supposed to go the gym to bike and he couldn't make up the 13 miles. He did put a good effort in though and I know he would have completed it if he could! 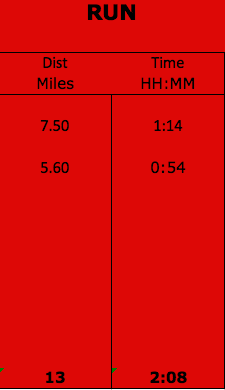 In case you can't see it because of the colors, the swim time was 44 minutes, the bike time was 3:32 and the run time was 2:08. Not bad! My overall time was 6:24! 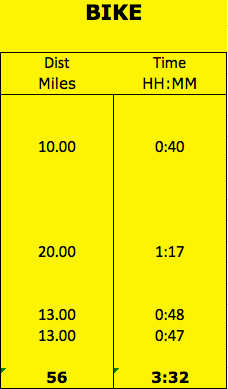 Can I do that when all 70.3 miles are done in a row without any breaks? I'm not so sure about that just now, but maybe! 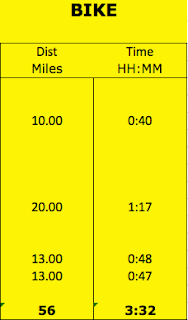 Next year Mike and I are hoping to do the Musselman Half-Iron, if all goes according to plan. I'm slightly disappointed with my swimming time, but that's because I used to be able to swim 1,000 yards in 11 minutes or so and the 1,650 in 19 minutes (at race pace). I really hope we can get into swimming shape soon! I know we will never, most likely, be as fast as we used to be but I want to get a little faster. Also, I definitely wouldn't go as fast as I could in the swim leg of a triathlon, I would still have the bike and run legs to get through! Plus, open water swimming is completely different than swimming in a pool (post coming about that topic soon). Have you ever done a real Half-Iron triathlon? What was it like? Which leg of a triathlon do you prefer? Awesome swimming distance! Is that non stop the entire time? Cause I can't manage to swim 200 m without stopping! I've never done one, but maybe trying it broken up like this first would be better! I don't hate swimming as much as many people, but I probably prefer biking a smidge over it. I'm slowly learning to hate running less. I have never done a half iron man, nor do I desire to....but you never know what the future holds! You never know! Doing an Ironman wasn't something that I wanted to do even a year ago, so maybe a half-iron is in your future! At least you can swim. I get tired after 25 yards on free style. I think I just must be moving too much and am really inefficient. You might be zigzagging in the lane, that would definitely make you tired quickly! Just try to swim in a straight line as much as possible. If you have a lane to yourself, try to swim over the center line in the lane to help keep yourself oriented. Ed - We didn't swim the distance at the same time, although we could have. We actually haven't swam in over a year, so we broke it up (a little differently each day we swam). 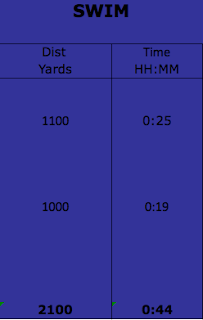 I think the longest we swam at one time was 400 yards, maybe 500. As we get into our training we will start swimming longer distances at one time. Good to know..i am trying to bring my game up! I didn't realize blogger had added a reply feature now, awesome! Thanks Christie! You are going to do awesome at your first tri, you are getting really strong! I agree - this was really fun! I think biking is going to be my weak point in triathlons, only because I haven't ridden a bike since my freshman year of high school. Some of my dear friends are Ironman competitors-it's actually a pretty big sport out here. We have a few local professionals (who place in the top 10 at the World's) who live and train here-I think being at high altitude offers a huge advantage as well as an abundance of land to do rides and runs and lots of open water! Thanks Ali! I had to look at your profile to see where you live, Montana, wow! It would be amazing to live around that many amazing athletes. I'm really impressed! Swimming is one of my weaknesses so any distance is amazing to me!